There are times where things are difficult to get to, and need some specialist tools. Trying to remove seals or bearings can be a nightmare so something called a slide hammer comes in handy. Basically it’s a weight mounted on a bar with various attachments on the end depending on the job. Old school repairs used to use slide hammers to remove dents which I will get to later. 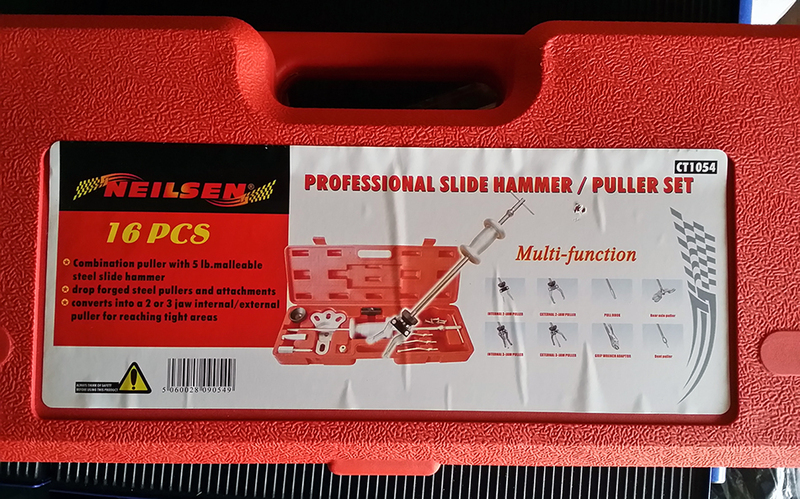 Combination Puller with 5lb malletable Steel slide hammer. Drop forged steel Pullers and attachments. Fully Hardened Shaft and accessories. Converts into a 2 or 3 Jaw Internal/External Puller. There is no instructions apart from the pictures on the front. But, it’s not to difficult to work out. 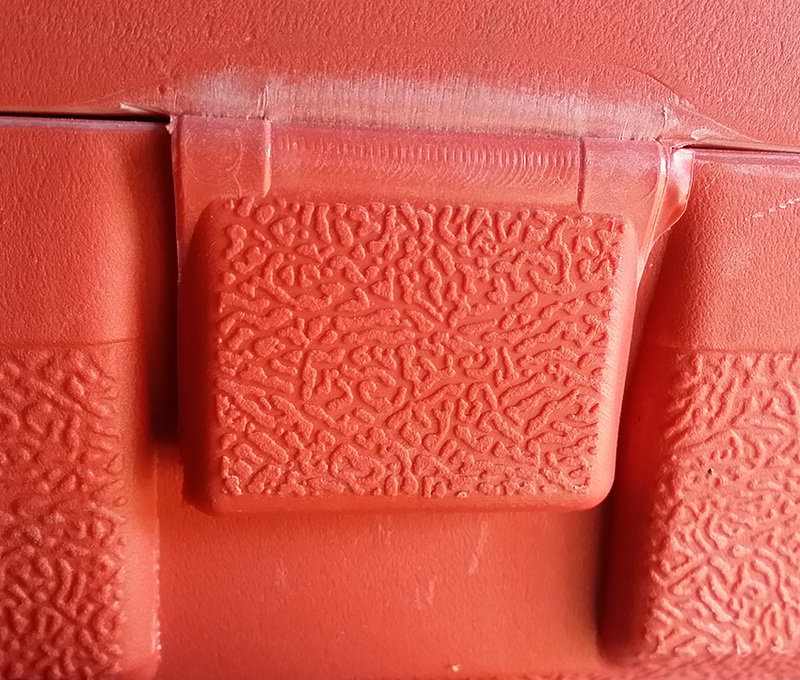 The rear hinge is sturdy and the front plastic catches look like they will do the job, although one side is showing a little sign of wear. The blow moulded case stores everything well and does not fall about inside. The case seems more than adequate to hold the heavy 5lb weight and all the other attachments. Firstly I must point out that I have big hands and the weight of the tool is quite formidable and means some serious business. even my large hands to not wrap around the weight fully and i suspect somebody with small hands could struggle. Maybe for the more delicate of jobs this could be a bit of over kill. The end of the bar has a thread that will be used to attach all the other accessories to it. The top of the bar has a static T-bar fitting. A large welded knot stops the hammer from going to far up or down the tool. I will start with the internal/external two or three leg pullers. The kit is supplied with three bolts that are required to be attached to the three or two leg pullers. This is a cheaper way of doing it of course to keep the costs down. But if you don’t use it that much it’s not a real problem. The leg pullers screw onto the end of the bar and the legs attached internal or external depending on how you mount them. Then a final disk is applied to keep the jaws in place. The forged parts seem sturdy enough but are not the best quality I have seen. The axle puller again is a substantial piece of metal looks man enough to handle the pounding of the slide hammer when in use. The dent puller is nothing more than a screw into a housing. This is old school where you drill a small hole in the dent and use the self tap screw to pull the dent out. Bearing in mind the weight of the hammer, given plenty of effort I could see the screw being pulled straight out of the hole. 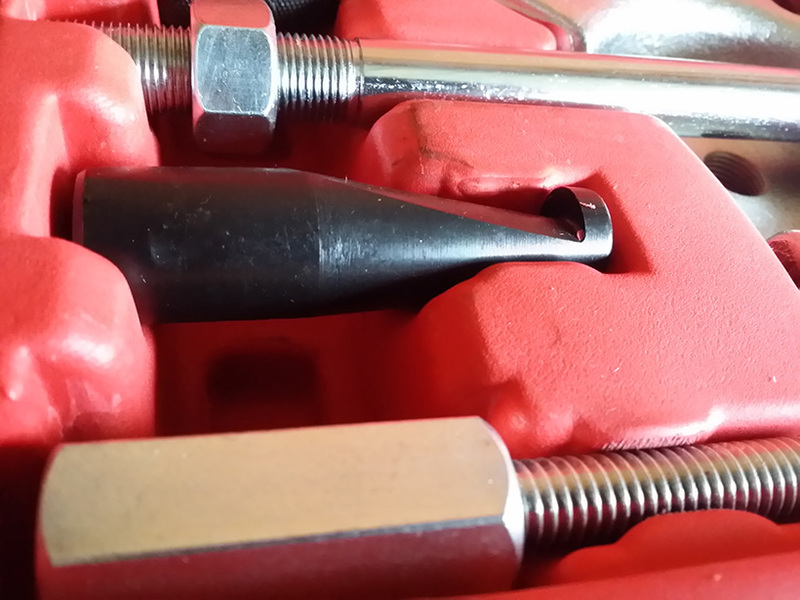 The next attachment is a threaded bolt that fits nothing else in the case as this is an adaptor for a grip wrench. This is a nice touch as I have not seen this in many sets. The grip wrench would have to be mounted real hard to take the full force of the weight on the bar. There is a lipped hook that will get behind some small items in order to pull them out. I have used the hammer to pull out an axle seal and it worked well but it can be a bit fiddly to align the legs up and keep them in place while getting to work with the slide weight. The overall weight will cause fatigue when used for a long time but that is what you expect when using a tool of this size. this is one of those tools that you don’t use very often, but when you do they are invaluable. The tool is labelled up as a sixteen piece set, but five of those parts are used for the three-legged puller on its own so it’s a bit misleading what you get. The quality of the machined parts is satisfactory but not the best in the world. The threads seem fine and should last the pounding from the slide weight. Overall a good multi purpose tool that will be used every so often.